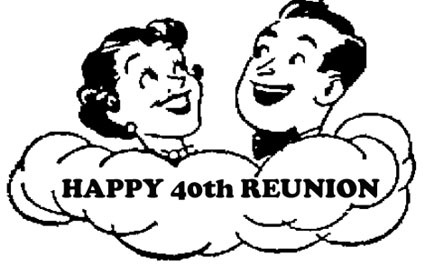 Well, I've lived long enough to qualify for a 40th high school reunion. This basically means, if we truly had lifelong learning, I could've started kindergarten three times and graduated three times, like Groundhog Day. But because it was just that one time, I set out on life after high school and now get to go back, a broken down shadow, a waste really, of what I once was. Fortunately, just to be truthful, I guess I'm not in as bad a shape as I could be. Of course I have some necessary aging, since I don't use any artificial means or extraordinary measures to hold it back. And you have to look a little old when you show up. If you looked 18 at the door they'd put you back with the hamburger servers. Plus, that'd be extremely freaky, like somehow you stepped through a time portal right after high school and looked the same as 40 years ago. I went to some garage sales today and saw a big orange and black boa feather thing. I thought it'd be the perfect accessory for my entrance, but I didn't get it. It looked a little too much like a Halloween decoration to be appropriate. If it would have been pink or purple, maybe. So I'm just going as myself, take it or leave it. But what I'm hoping for is that I can set aside my natural shyness enough to be engaging, even with people I never really knew. As for the ones I actually knew, that ought to go OK. My resolution is that I'm not going to drink, so I'm not going for any artificial courage of that sort. There's a lot on my mind. But to write it, it looks pathetic on the screen, like the resolution I'm thinking of not to be a social parasite. This is terrible, worrying whether or not I'll be a social parasite at an event that's supposed to be fun. The key thing, just breathe, try to feel comfortable in your own skin. Don't buck yourself up by comparing yourself to others. You're a person of worth and dignity. Maybe a little social parasitism wouldn't be so bad. I wonder if actual parasites know when their host is dying, so they can get to another host in time to sustain health and life. That's the way soap operas work on TV. They're always off to a fresh storyline three weeks before the current storyline dies. Just an aside. It'd be good to have a psychological GPS, in addition to my normal brain, where it tells me the exits ahead. Maybe one beer wouldn't hurt. Just train my taste buds on the essence of the alcohol and direct it to all the little receptors in the brain that regulate this stuff.